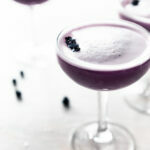 Be the toast of the town when you whip up this Blueberry Clover Club cocktail, a twist on the classic version and perfect for a party, happy hour, or girl's night in! Combine the blueberries and water in a small pot and bring to a low boil. Allow to cook untouched for 5-10 minutes, or until the berries release their juices and the color of the water matches the color of the blueberries. Strain into a cup, then stir in the sugar until it dissolves. Let cool. In a cocktail shaker, add the gin, syrup, lemon juice, 7UP, and egg white. Dry shake without ice for a full 10 seconds, then add a scoop of ice and wet shake for an additional 10 seconds. Strain into a small coupe glass and serve immediately. Please enjoy responsibly.